Yes yes, once again I have found myself in a Primark. I didn't lie when I said I have an addiction to that shop! This time I spent £31 which isn't too bad considering I brought an outfit plus extras! Grey skater skirt with elasicated waist - £8. White sleeveless shirt - £8. Oversized long sleeved top - £5. 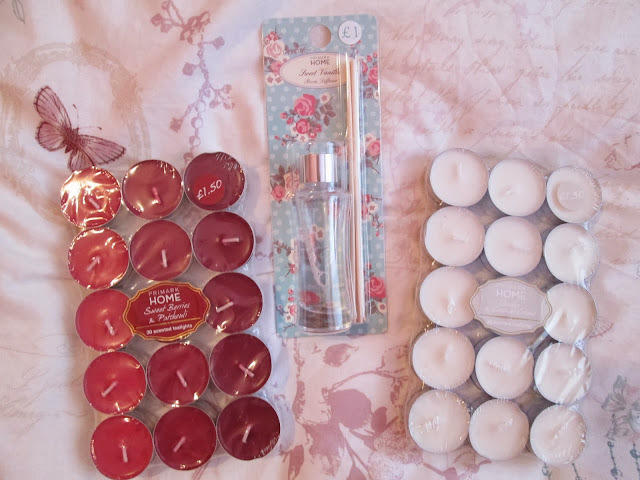 Two packs of tealight candles - £1.50 & Mini diffuser £1. Multi ring necklace - £3. I brought the skirt and white shirt as I hoped to wear them together for a party I have coming up but they both looked nice on together and separate. The red top was just for everyday casual wear but I needed something with long sleeves for the cold weather! I love their home range and I always seem to buy something from there every time I go. I've brought a reed diffuser from them before (which smelt gorgeous), so I decided to buy another one in a different scent. Also 30 gorgeous smelling tea light candles for £1.50 is a bargain! Lastly is the necklace. I have seen a few of these in other shops and have always thought they're abit expensive for what they are but when I saw this one in Primark for £3, I couldn't say no to it.